The Classic Sports Car Club is based at Corsham so the busy two day programme will feature many local entrants in a variety of classic and otherwise interesting cars, with support from the famous clutch manufacturer. The '50' part of the title refers both to the anniversary of the re-opening of Castle Combe circuit in June 1962, after its closure following the 1955 Le Mans disaster and to the prospect of a 50th win by an E type Jaguar. Norman Davidson-Kelly is one of the entrants hoping for a Jaguar victory in the 40 minute 'Swinging Sixties' race with mandatory pit-stops to add to the flavour. Likely to be engaged in a close class battle are local drivers Charles Marriott from Cirencester in his Turner MK11 and Frome's Andy Vowell in his Triumph Spitfire, both having won at Castle Combe in the past. Other interesting cars include NSU TT, Ginetta G12, Reliant Scimitar plus Volvo, Lotus, Alfa and MG representation. Bristol's Sam Summerhayes is one of a number of Mini drivers whilst Roger Lee from Lechlade is in a 1961 Lotus Seven. One of the most eagerly awaited races of the year is that for the CSCC's 'Special Saloons'. Rekindling the memories of the highly modified 'saloon' cars which ran in the 1970's, the series also allows cars from the Thundersaloons championship which was so popular at the Wiltshire track in the late'80's and early '90's. Many thoughts will be with Chipping Sodbury's Vince Woodman, the veteran saloon car ace, who recently suffered a stroke. Teamed alongside fellow West Country man Jonathon Buncombe, Vince won the 1989 Thundersaloon race at his local circuit aboard the mighty Vauxhall Dealer Sport Carlton-Chevrolet V8 which will be raced on both days this weekend by Pete Stevens. Stevens took the car to third in the 1993 race, and won it in 1994. Major local opposition comes from North Wraxall's Ian Hall in his versatile Darrian Wildcat T98 which has won various races, sprints and championships, including its class in Castle Combe's Sports and GT championship last year. 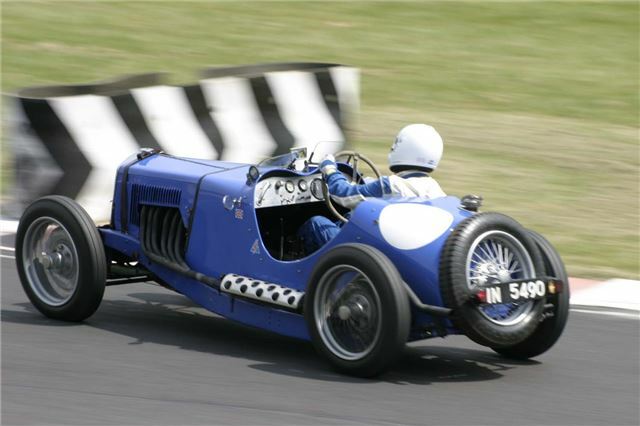 Two races for Castle Combe's three local championships are sprinkled amongst the 'classic' races, with the Vadabar Sports & GTs likely to draw a few extra entries from the visiting races. The speed of these cars is something to behold and amongst the contrasting machinery is the Radical PR6 of Josh Smith from Weston Super Mare and the BMW E63 M6 of Vadabar M.D. Doug Watson from Blagdon. Bath drivers Des Andrews and Guy Parr have had competitive outings this year in their respective Megahart and Nemesis cars run by the Dursley based Wayne Poole Racing team. After the disappointment of a gearbox failure last time, Parr will be back out in the Castle Combe Saloons race in his B class 1.6 litre Fiesta. Corsham's Will Di Claudio is the man he and all the others have to beat. The little Peugeot 106 has flown to a perfect record of poles, wins and fastest laps this year and is quite capable of running at the front with the bigger A class cars. Of those, the Audi TT of Calne's Tony Hutchings is the car with possibly the best chance of defeating the Rover Turbo Tomcat of Southampton's Adam Prebble, which has won all the races it has started this year. The Astra of Bristol's Mark Wyatt has the speed but hasn't quite had the conditions to take a win, whilst also fast and capable of a result are the likes of Bridgwater's Tony Dolley in the 206, Trowdridge's Mark Funnell in the Mini, Melksham's Rob Ballard in the SEAT Leon and Ditcheat's Kevin Bird in the unique BMW 1 series. Bird's son, Charles Hyde-Andrews-Bird, is looking strong in class C in the Fiesta and is Di Claudio's closest rival. A non score by the Peugeot driver this weekend could see the 'baby' class top the points yet again. The circuit's Formula Ford 1600 championship, in association with Startline, saw a new points leader after the last race weekend, with Saltford's Steven Jensen deposed by Bratton's Ben Norton, who took two emphatic wins. The Wiltshire College driver will be hoping for more dry conditions as his Spectrum is unhappy when it rains, unlike Jensen's similar Kevin Mills run car, which is happy to splash through the puddles. Fellow race winners and KMR team mates, Roger Orgee from Langport in the Van Diemen and Nathan Ward from Coventry in the Spectrum will be ready to pounce at any opportunity in this fabulously close contest. Yatton Keynell's Luke Cooper, a race winner at other circuits, is desperate to put that right at the track which borders his family home. His Swift Cooper team mate, 17 year old James Raven from Portsmouth is the leading B class driver, though Burnham-on-Sea's Richard Higgins shares his number of wins. More 'Classic Sports Car Club' action comes from the 'Tin Tops', 'Magnificent Sevens', 'Deutsche Marque' and 'Future Classics' races, where a number of West Country drivers are entered. In the 'Tin Tops', Bristol's Patrick Buss has his Golf GTi, and in Ford Pumas, Frome's Stuart Adam and Stonehouse's Toby Harris pairing up with Lisa Selby. Quedgeley's Paul Anderson is used to winning in his Porsche 928 in the 'Future Classics' race, whilst Castle Combe regular, Tim Woodman from Bristol is back with his Caterham 7 in the 'Magnificent Sevens'. Mark and Alan Drain from Churchdown, Gloc's, Bristol's Mike Aikens and Salisbury's Anthony Bennett are other local '7' drivers. Richard Ibrahim from Brent Knoll and Shepton Mallet's Brian Jordan share a BMW M20 in the 'Deutsche Marque' race with Frome's Dominic Malone in an M3 CSL. There are also a couple of races specifically for all kinds of Jaguar, as well as the Gadgethelpline.com 'Classic 60's Sports vs Saloons' race and a couple of all comers/open races to complete the packed programme. Saturday's action starts with qualifying at 08:30. Racing gets under way from 13.00. Sunday gets under way with qualifying at 08-35, with the first race at 12.20.